​IF YOU DON'T SEE A SONG ON OUR LIST, JUST ASK! WE'RE ALWAYS LEARNING NEW SONGS AND WILL GLADLY LEARN ANY ADDITIONAL IRISH SONG FOR A CLIENT UPON REQUEST. WE ALSO PLAY SOME COVER SONGS. 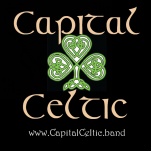 CONTACT US TODAY TO DISCUSS HAVING LIVE IRISH MUSIC AT YOUR EVENT IN VIRGINIA, MARYLAND OR DC.